I wonder what’s going on in here…. Rushing Topher’s wife into the ER. 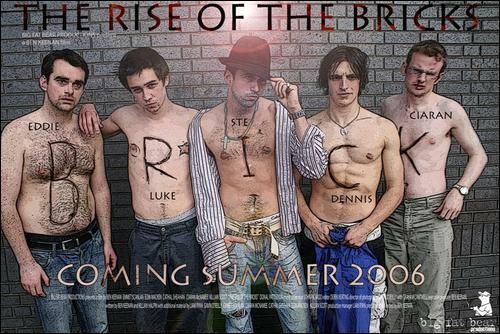 The Rise of the Bricks is a no budget feature shot on Mini DV over a period of 9 months, 23 shooting days, 27 different locations with 55 speaking parts. It is a mockumentary about a talent less college band who get signed to a record label by a producer who was out to Sabotage the record company deliberately. It stars Emmett Scanlan, Cathal Sheehan, Eoin Macken, Killian Scott, Ciaran McNamee. Written and directed by Ben Keenan. Official website Visit our gallery for more pictures.